The Brunk Brothers Revival Campaign (later known as Brunk Revivals, Inc.), an influential revival work among the Mennonites of North America, began in 1951. It was carried on by Preacher George R. Brunk II (1911-2002) of Denbigh, Virginia, the evangelist, and his layman brother Lawrence (1917-2003), who served as business manager and song leader. 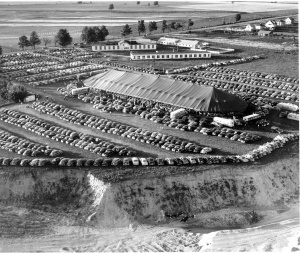 This team of Christian workers, using a large tent seating 6,000 persons, moved from one large Mennonite center to another during the open season from April to October, holding nightly meetings in a community for three-four weeks, to revive the church and evangelize non-Christians. The following communities were served through 1952: 1951, Lancaster, Pennsylvania, Souderton, Pennsylvania, Orrville, Ohio, Manheim, Pennsylvania; 1952, Johnstown, Pennsylvania, Waterloo-Kitchener, Ontario, Goshen, Indiana, Harrisonburg, Virginia, Morgantown, Pennsylvania, as well as two campaigns in Florida in the winter of 1952. In each series of meetings from 1,000 to 2,000 persons accepted Christ for the first time, renewed their covenant as members, or made a deeper consecration as Christians. The work was financed solely by offerings. Although modern methods of organization were used, the methods of preaching and the sermon content, etc., were simple and in conformity with good evangelical Christian and historic Mennonite faith. Over the duration of the campaigns, which ended in the early 1980s, over 100 tent crusades were held. George R. Brunk earned a Th.B. degree from Eastern Mennonite University and a B.A. from the College of William and Mary. He received the B.D., Th.M. and Th.D. degrees from Union Theological Seminary, Richmond, Viriginia. Brunk taught at Eastern Mennonite College (now University), 1949-1978, and at Eastern Mennonite Seminary, where he was professor of practical theology. He served as seminary dean, 1967-1976. Bishop, Jim. "George Brunk II Dies at 90; Was Evangelist, Seminary Dean." Eastern Mennonite University News Archives. http://www.emu.edu/marketing/news/gbrunk2d.html (accessed 5 December 2009). Bender, Harold S. and Sam Steiner. "Brunk Brothers Revival Campaign." Global Anabaptist Mennonite Encyclopedia Online. 2009. Web. 26 Apr 2019. http://gameo.org/index.php?title=Brunk_Brothers_Revival_Campaign&oldid=135770. Bender, Harold S. and Sam Steiner. (2009). Brunk Brothers Revival Campaign. Global Anabaptist Mennonite Encyclopedia Online. Retrieved 26 April 2019, from http://gameo.org/index.php?title=Brunk_Brothers_Revival_Campaign&oldid=135770. Adapted by permission of Herald Press, Harrisonburg, Virginia, from Mennonite Encyclopedia, Vol. 1, p. 453. All rights reserved. This page was last modified on 26 August 2016, at 15:27.